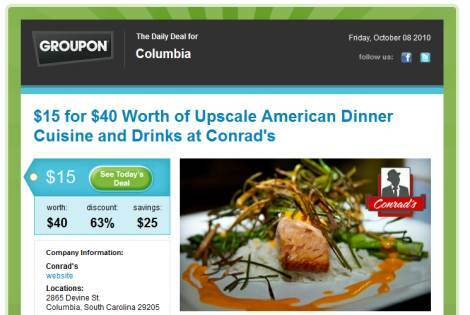 Daily deal sites like Groupon and Living Social are springing up all over the place these days. These deal sites offer significant discounts on everything from pizza and sushi to teeth whitening and massages. These deals are great for consumers, but are they effective for marketers? There has been a lot of criticism lately over the Groupon business model, and by extension the entire daily deal phenomenon. Part of that criticism has focused on the ineffectiveness of one-time deals in building brand loyalty and a truly loyal customer base. All too often, when the deals are gone, so are the customers. While part of the problem lies in the daily deal marketing model, there are also issues with how these deals are presented to customers. One of the most significant problems is that the email blasts announcing those daily deals are rarely targeted or segmented. That means the 50 percent off offer for that great new steakhouse goes out to everyone – even the vegetarians. A smarter strategy is to segment your email list and target your audience more effectively. Perhaps the vegetarians on the list would like to know that the steakhouse also offers a daily salad bar, or that there are specials are fresh seafood as well as steaks. 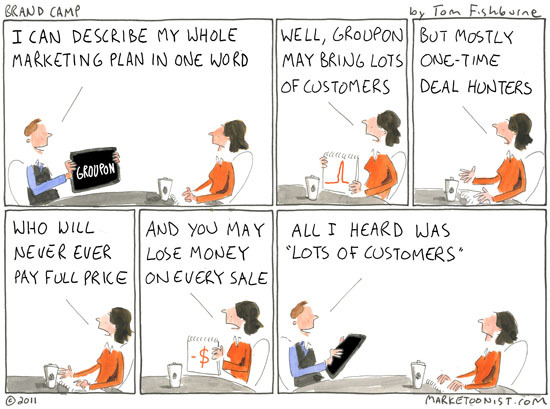 Another criticism of Groupon, Living Social and other daily deal sites is that they are one-trick ponies. If the targeted customer is not interested in that particular deal, chances are they will never visit the business in question or become a customer. Smart marketers can learn from the mistakes these sites have made by using their email marketing to grow their brands and customer loyalty – not just attract one-time customers. Timing is another important piece of the email marketing puzzle, and this is one place that Groupon generally gets it right. Lately many of my Groupons have been arriving later in the week – often on Friday afternoons. This makes sense, since buyers are ready for the weekend and perhaps thinking about where they will go for dinner on Saturday night. Email marketers can learn a lot from this smart strategy. Targeting customers when they are ready to buy can boost your response rate – and your profits – substantially. Keep in mind that most of your audience receives dozens, or even hundreds, of emails a day. If those customers are not in a buying mood when the email arrives that message will quickly get buried under a ton of other pitches. Striking while the iron is hot is always a smart strategy, and that is definitely true in the highly competitive world of email marketing. Daily deal sites like Groupon and Living Social have a lot to offer – and a lot to teach email marketers. Analyzing the Groupon model, adopting the strategies that work and changing those that don’t, is one of the best ways to raise your response rate, gather new leads and grow your business.